Viewed from atop Aspen Mt. near the Sundeck in 2017. The view probably didn't look much different in 1943. 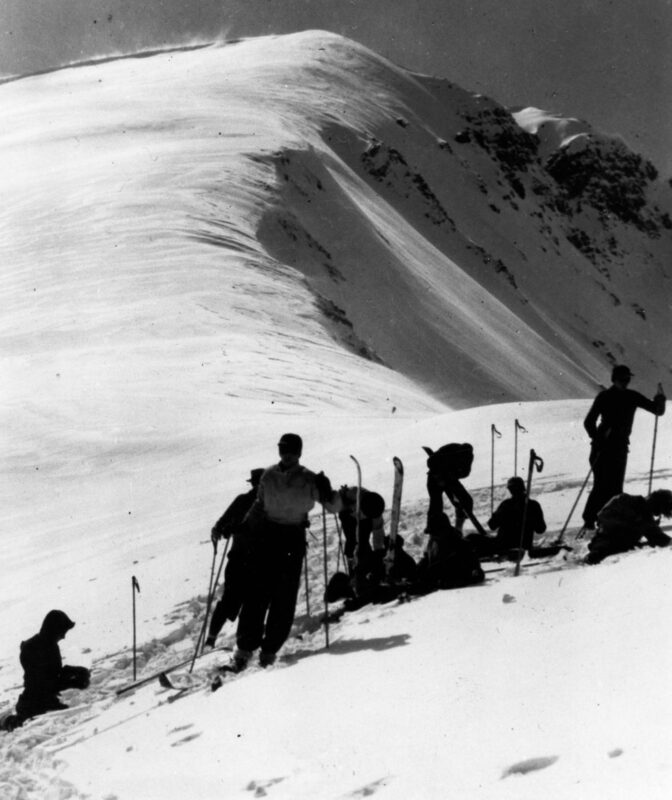 Hayden Peak, middle right, with its adjoining peaks, made up the 1938-proposed Ski-Hayden complex. All would have been ski-accessible via the Highland Bavarian Corporation’s proposed aerial tram From right to left today, the peaks are identified as Stammberger Face, in the first cloud; North Hayden or today’s 'Ski Hayden,' with its face often laced with ski tracks; true Hayden Peak; South Hayden, just behind Hayden Peak; Monument Peak, middle foreground; Electric-Hayden ridge behind Monument; Electric Peak; Avalanche Peak or Yellow Boy. 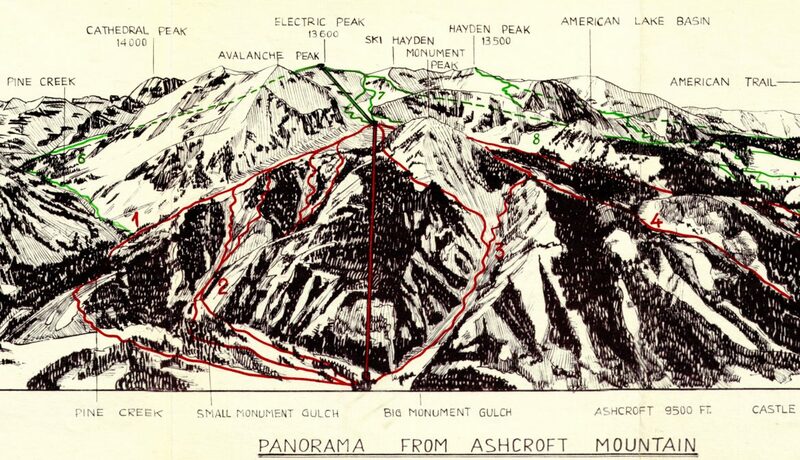 ASHCROFT – Imagine you are riding the new Aspen aerial tram in 1943 from Ashcroft to Hayden Peak on a bluebird day of spring skiing. You, wearing an Admiral Byrd fabric anorak atop gabardine ski pants bloused over snowflake wool socks and your girlfriend, wearing a wasp-waisted, tuck-in Jantzen ski suit, complain about the housing shortage in Ashcroft. Thirty-five skiers jostle like vertical sardines in the full, octagonal gunmetal cabin as it travels 4,000 vertical feet from the valley floor. A single operator at the controls stands near the trap door and hemp rope coiled for possible evacuation. The breathtaking span on the bowed cable is 500 feet off the ground. You white-knuckle your wooden Groswold skis that stand three feet taller than you as a wind gust swings the cabin, causing a collective gasp among passengers. As you pass over American Lake, the deck at the alpine hotel below overflows with the bronzed who’s who of the budding international ski era. Out of the Jules Verne-like plate-glass window, you can see for hundreds of miles and across the crown of the continent. On the windswept ridge you check out the nearly 5,000-vertical-foot run down Conundrum Creek that leads back to the Highland Bavarian Lodge. Another time, you decide, as your girlfriend shoves off ahead of you down American Bowl to the hotel for fondue. What brought this quantum alternative in Aspen’s early skiing history to the brink of possibility still remains an intriguing speculation of what might have been. But for the window of unregulated wild West opportunity shrinking to a nut and two fateful events — a war and the death of one of the project’s main boosters — there may have been a Hayden-centered, Euro-style alpine resort adjoining the ski mountains that exist here today. 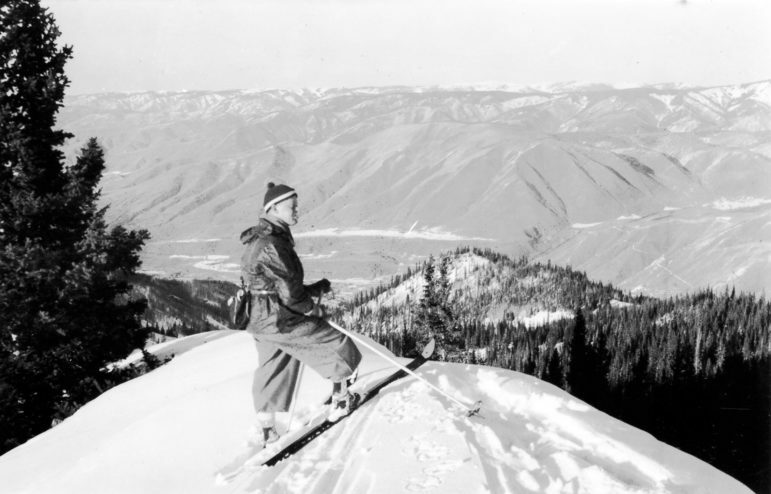 Between 1936 and 1941, the will was there, the money was there, and the terrain was available to make Ski-Hayden a reality. As the new sport of “downhill only” skiing caught on, a handful of privileged men who’d caught the ski bug in the winter sports scene of the 1930s in Europe hatched a grand vision: Build a European-style winter resort in the United States. From these ranks came two, William “Billy” Meade Lindsey Fiske III and Theodore “Ted” Ryan, who attended elite schools and chummed around in European circles. With their worldly connections and family wealth — Ryan operating out of New York and Fiske in California — they raised money to get the first Aspen ski lodge and Hayden project off the ground. But before these two teamed up, a chance meeting in Pasadena, Calif., at a polo after-party between semi-retired Aspenite Tom Flynn, a booster of Aspen silver mines, and Fiske, at 24 a bob-sledding Olympian and renowned sportsman, led to a barnstorming plane flight back to Aspen to investigate the skiing potential. This swashbuckle spontaneity was a seminal event that sparked Aspen to become the skiing mecca it is today. Left to right are Billy Fiske, Otto Schniebs, Joe Sawyer, Bob Rowan, and Mike Magnifico in Ashcroft, 1937. Fiske, the original visionary for Ski-Hayden, was a two-time bobsled Olympian in 1928 and 1932 and known as a wealthy, daredevil sportsman; Schniebs started the first Ski School in the U.S., in Massachusetts and coached the Dartmouth ski team from 1930-1936, coining the phrase, “Skiing is more than a sport, it is a way of life” ; Joe Sawyer was one of a few hold-out miners in Ashcroft when the Highlands Bavarian developers first came to town in 1936; Rob Rowan developed downtown L.A. in the 1930s and had a large stake in the Ski-Hayden project; Mike Magnifico ran Magnifico Sports, the first ski shop in Aspen, where he hand-made leather ski boots. Magnifico Run on Aspen Mountain is named after him. Note that Schniebs and Rowan both have the same ski-school emblems on their jackets. By varying accounts at the Aspen Historical Society, including Ryan’s transcribed recollections, Fiske enlisted his future brother-in-law Jim Heaton to fly a single-engine tail-dragger Stinson Reliant to Aspen for a look. Stuffed into the four-seater with Fiske were his fellow Cambridge University grad Paddy Green and Robert Rowan, who was largely responsible for developing downtown Los Angeles. They circled Glenwood Springs until they found a “sort of field, a kind of golf course” to land on. Fiske then called his Euro-touring friend and Yale-grad Ryan in New York to say he’d found the terrain in the Colorado high country that could supersede St. Moritz. 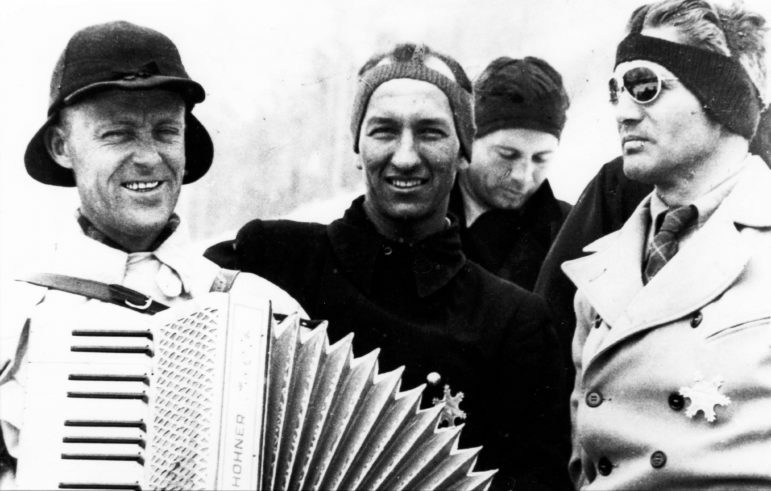 Earlier, at the 1936 Olympics in Germany where Fiske had declined to participate as a bobsledder because of the Nazis, the two fancied bringing the European winter-sports center concept to the U.S.
Highland Bavarian Lodge, in 1937. 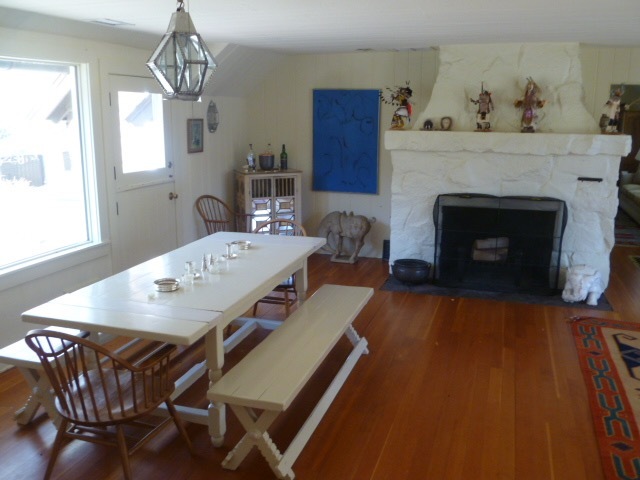 The dining room of the Highland Bavarian Lodge, 2017. In spite of the Great Depression of the 1930s, “downhill-only skiing” caught on in the U.S. along with the proliferation of low-cost rope tows. According to a Maine ski history book, “First Tracks,” in 1936 when a rope tow opened in Fryeburg, 200 came to ski and 3,000 came to watch. By 1937 the American Ski Annual counted 100 tows in the U.S. Skiing without having to climb had no comparable winter activity for upscale outdoorsy people. With the popularity of Cannon Mountain in New Hampshire and just-opened Sun Valley, Fiske, Ryan, Rowan, Flynn and Tom Harrison of Denver formed the Highland Bavarian Corporation, with a plan to build a ski destination up Castle Creek. 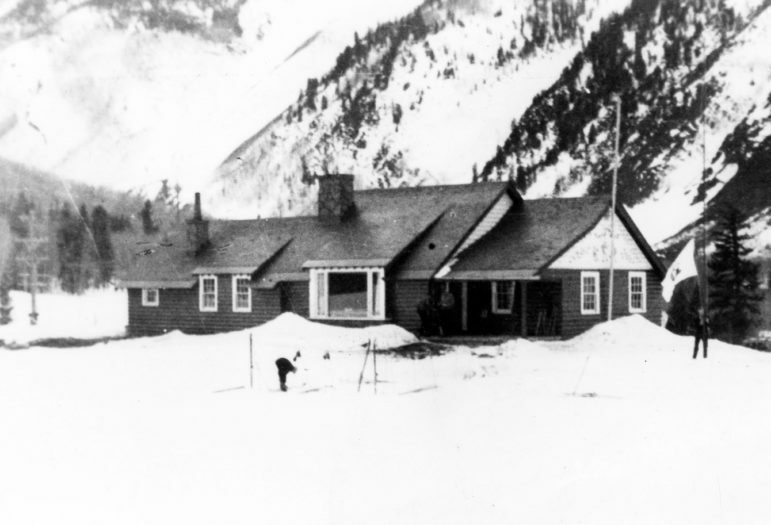 In a frontier era of easy development, they bought Bill Tagert’s Highland Ranch at the Conundrum Creek and Castle Creek intersection (Highland Meadow) and built the Highland Bavarian lodge in five months before opening for business on Dec. 26, 1936. With an elegant-rustic décor and a Bavarian architectural theme (the lodge stills stands there today, for sale), they offered Philippine mahogany bunk beds with privacy curtains and a reading lamp, a grand two-sided stone fireplace that connected the communal living and dining rooms, a Bavarian chef and his wife, and ski tours up Little Annie’s. All this for $7 a night ($122 today). Dr. Gunther Langes, left, plays a Bavarian tune outside the Highland Bavarian Lodge, 1937. To his right, Henrich Schienbach, Philip Tomlinson, Otto Schniebs, and Florian Hammerle. 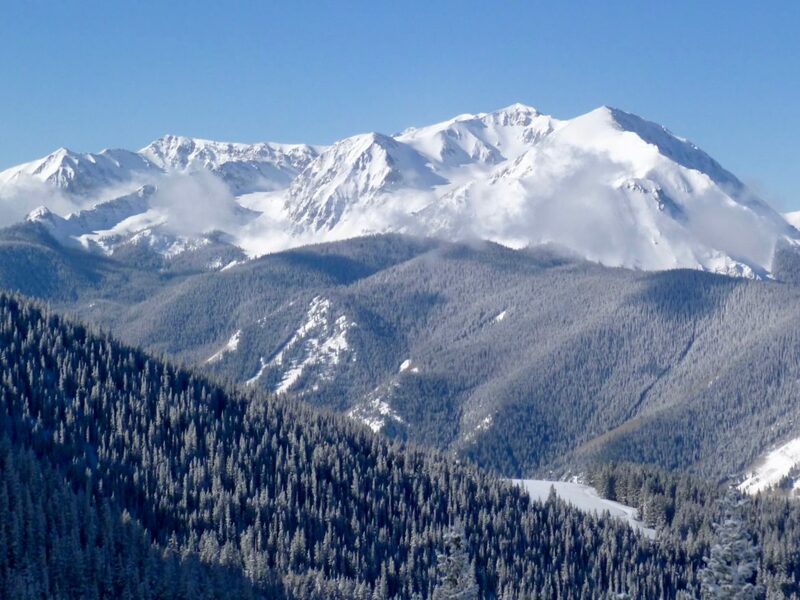 With Flynn as lodge manager and chief operating officer, Fiske invited Andre Roch of Switzerland and Dr. Gunther Langes of Italy, two of Europe’s most formidable ski and avalanche experts, to evaluate potential ski terrain in Aspen. Roch, a University of Oregon engineering grad, had skied Mount Hood first and racked up first ascents in the Alps and Asia. Langes fought with the “Tyrolean Hunters” mountain regiment in World War I, gained a doctorate in German law, and later invented the giant slalom. The two mountaineers journeyed 12 days from Geneva, arriving in Glenwood Springs by train, where Flynn and Tagert picked them up, according to Roch’s account “Once and Future Resort” in the 1985 Colorado Heritage magazine. At 1 a.m. they roll into Aspen. Roch recounts that his “first impression was sad. The town is empty and dead. There is no snow, and December wind drives dust through the streets.” Roch and Langes are soon installed at the Highland Bavarian lodge, headquarters for their investigations. Roch observed that the ski terrain surrounding the Highland Meadow, which had been chosen in summer by the Highland Bavarian Corporation board, was totally wrong for skiing because of exposures. Richmond Ridge and Annie Basin faced south or west and the strong sun melted the snow because it was “the same latitude as Sicily.” The other terrain in the Five Fingers area above Conundrum was too windblown, cliffed, and avalanche prone. Roch and Langes thought the Aspen Mountain side had good snow but the lower slopes were avalanche prone and littered with mining debris. From atop Richmond Ridge, Mount Hayden caught their fancy. Open bowls led into shaded gullies with lots of vertical skiing. The magnificence reminded them of Davos and St. Moritz. Andre Roch and Billy Fiske, 1937, preparing to ski. After exploring access to the Hayden slopes in early January, where the two experts became entangled in fallen timber, Roch returned on Jan. 15, 1937, to make a solo climb of Hayden. He liked that Ashcroft sat in the center of a natural bowl surrounded by peaks reaching above 13,000 feet. The east- and north-facing slopes “appeared well suited for skiing” and provided some 4,000 vertical feet. Leaving at 2:30 a.m. from the lodge, Roch made it to American Lake in a wind storm that obscured his trail. As he skinned from there up the open slope he observed the rocky moraine debris along the sides of the one-time glacier. He stashed his skis and hiked to Tom’s Peak (now South Hayden). There the false summit surprised him. Hayden Peak was still a half-mile away along the ridge. 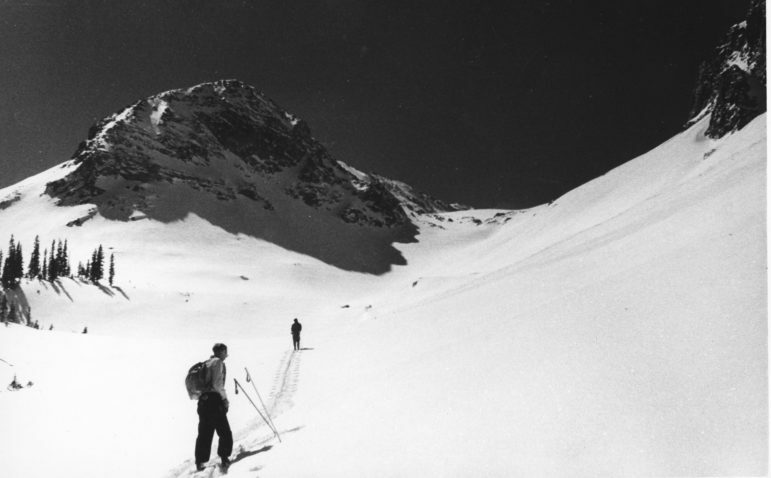 “The wind was so powerful that breathing became difficult,” and at 2 p.m. he chose to descend without summiting, but not without seeing the surrounding potential and the “magnificence of Maroon Bells, Snowmass, Pyramid, Castle and Cathedral peaks.” He decided that Hayden was where the skiing should be, not Richmond Ridge. 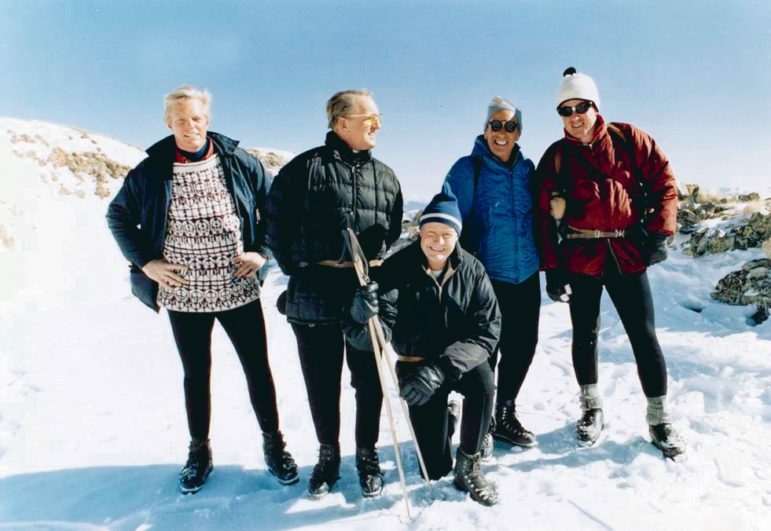 In a recollection of Roch anecdotes after his 2002 death, his Aspen friend Robin Ferguson, who Roch had picked up hitchhiking in Chamonix, wrote in an Aspen Times letter how Roch liked to ride up to Ashcroft from the lodge on horseback with his skis over his lap and then slap the horse’s hindquarters, sending it back down to the lodge stables. Billy Fiske ahead of Andre Roch climbing Mount Hayden, 1937, perhaps in May along with Otto Schniebs behind the camera. After charting some 35 possible ski tours, a May trip up to the top of Hayden Peak with Fiske and Langes sealed the deal. The high bowls with their consistent five-month snow conditions were where the Highland Bavarian group should focus development. 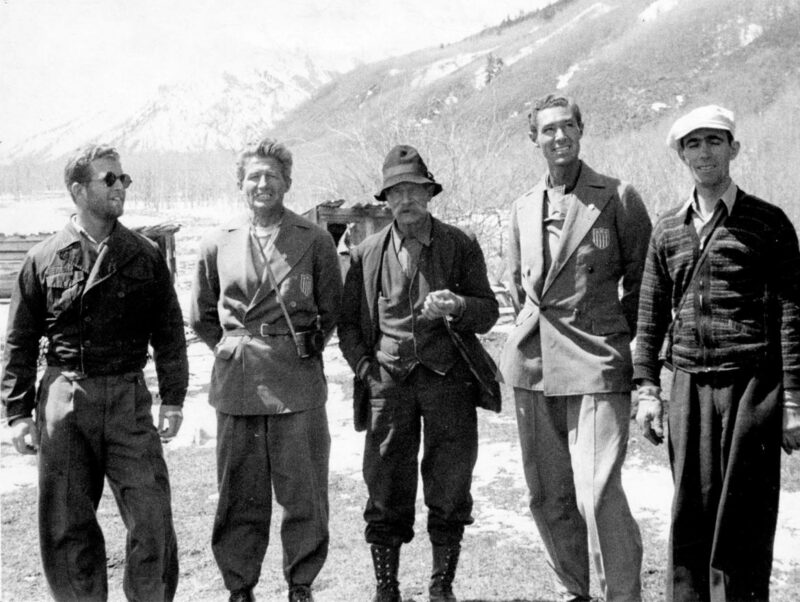 Four more ascents followed that month with, among others, famed Stowe ski instructor Otto Schniebs, Denver ski manufacturer Thor Groswold and Aspen skiers Fred and Frank Willoughby. Roch and Langes continued photographing terrain and mapping ski trails there. As expert endorsements stacked up, they proposed a two-stage aerial tram to the top of the Hayden-Electric Peak ridge. Earlier trips from the top of Independence Pass down Hunter Creek and an excursion up Mount Elbert narrowed their focus back to Ashcroft. They also toured Lost Man and Green Mountain on the pass, noting how the skiing was great but the vertical short. They then climbed Castle Peak from Pine Creek via Cathedral Lake, skiing one time by the Montezuma Mine. Dazzled by the big terrain, they pushed for building a Swiss-style village in Ashcroft at the base of the new tram, complete with a winter sports center. Roch’s recollections said, the “Immense schusses, where your face freezes and clouds of powder rise behind you, make the skier feel like a rocket.” Roch dubbed the new area Ski-Hayden. Andre Roch and the Los Alamos Ranch School Ski Team taking a break before skiing down Mount Hayden, 1937. 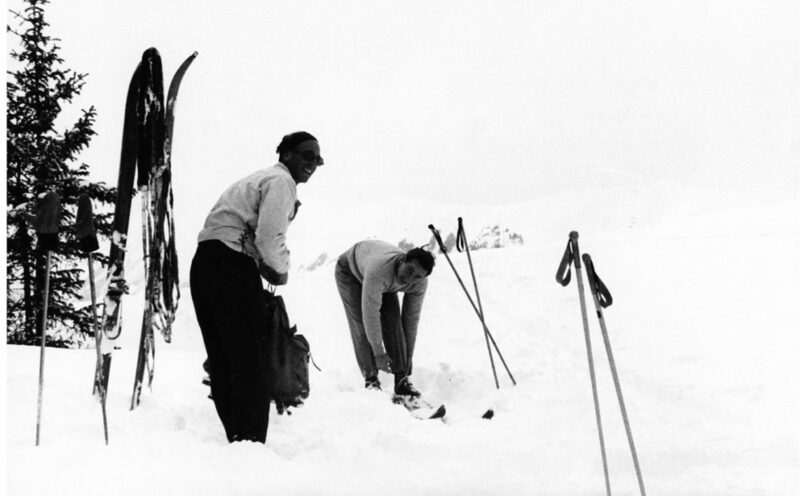 Andre Roch, left, and Billy Fiske atop Hayden Peak before a ski down in 1937. 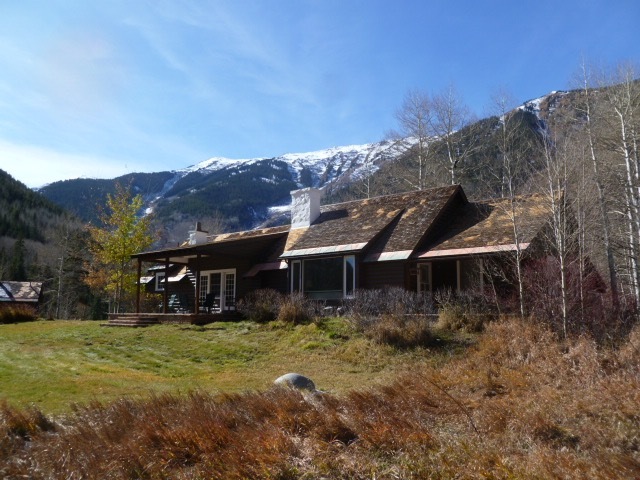 With Ashcroft largely abandoned since its heyday as a mining center in the early 1880s, sourdough poet Jack Leahy, the last original resident, held out for $50,000 ($850,000 today) to sell his 90-acre property, wrote William Convery in a 1997 Highland Bavarian compilation, “Ski Heil!” That now-awkward German phrase had been painted under the eaves of the HB lodge, over an array of Bavarian figures. Somehow they made a deal with Leahy and from 1937 to 1939 the corporation put together a comprehensive booklet called “Mount Hayden Passenger Tramway Colorado,” in which Colorado legislators, national railroads, mountain clubs, a Grand Junction hardware store and even the German ski team — who ascended Hayden in 1938 with tiny swastikas on their sweaters — endorsed the plan. The backbone of the Hayden report contained three proposals that distilled specifics, a study by American Steel and Wire Company of the aerial tram, and two individual summations of the 1936-1937 year of research by Roch and Langes. Andre Roch and the Los Alamos Ranch Ski Team doing a ski descent of Hayden, 1937. Consensus held that a Hayden tram would pay for itself as a year-round tourism draw. A shorter American Steel and Wire tram in Franconia, N.H., had smashed expected revenues within one year of opening in 1938. Newspapers billed the conceptualized Hayden machine as the longest aerial tram in the world at the time. The AS&W tram would be built in two parts. A dog-leg design put the first section beginning at the “Valley Station” near Leahy’s cabin in Ashcroft at 9,400 feet, rising to “Monument Station” near American Lake and an alpine hotel at 11,400 feet, the length being 10,075 feet of cable. The upper section would rise from the Monument Station to a point between Tom’s Peak and Electric Peak at 13,400 feet on 5,600 feet of cable. With opposed up-and-down cabins on a double cable on both sections, 193 persons per hour would have an 11-minute ride with five trips per hour on the lower section. The upper section would be a seven-minute ride time with seven trips per hour. The lower cabins carried 37 passengers and the upper 25, each with a single attendant. Two 125-horsepower electric motors at the Monument Station would drive the two sections, necessitating electrical lines to 11,400 feet, otherwise gas or diesel at a greater cost. The design emphasized a five-brake backup system that included a hand-operated lever on the drive sheave as well as a centrifugal brake on the cable speed. The cabins would have lighting and heat, with speed, position, and wind indicators for the operator. Thus, “to carry the guests to the great open slopes” above timberline, where in the United States heretofore only timber-sided ski trails at lower altitudes existed, serviced by rope and T-bar tows, an American-engineered marvel could be built for $1.12 million ($21 million today). Already, Schniebs headed up a team with a summer camp on Hayden to mark tower placements. The theory went that with Ski-Hayden featuring a tram built and operated by the Forest Service, there would be no need to journey all the way to Europe to ski big open snow fields. Dr. Gunther Langes on a mine dump near the top of today’s Ruthie’s chairlift in 1937. Bell Mountain, Red Mountain, and Aspen are in the background. Andre Roch, in front of Highland Bavarian Lodge in 1937. The two Euro design consultants initially mapped multiple steep shots connecting to eight arterial ski runs, some down Pine Creek, Monument Gulch, American Basin and Sandy and Sawyer creeks, to deliver better snow conditions with more sun from December through April than anywhere in Europe. Though the 1936-1937 winter yielded an average Aspen snowfall of 169 inches, locals told the visiting specialists that it usually snowed a lot more. Roch and Langes filed their final reports for the proposal from Europe in 1938. 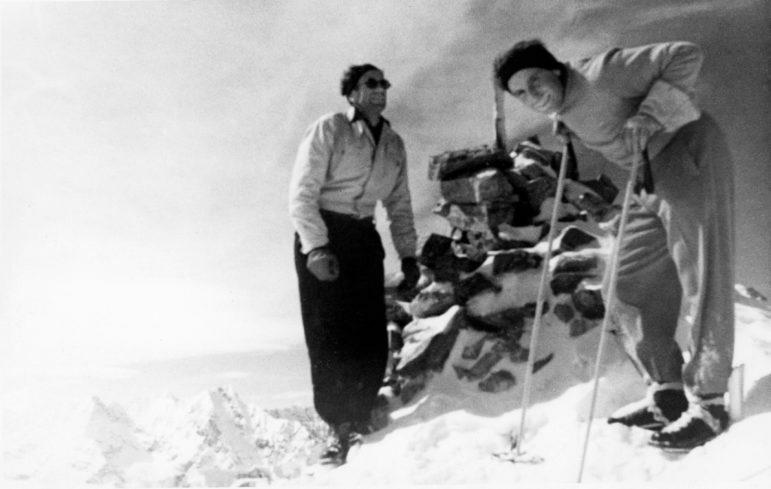 Langes had returned to his beloved Dolomites, while Roch returned to Geneva to lead the Swiss Institute for Snow and Avalanche research; but not without marking out his famed Roch Run on Aspen Mountain to kindle world interest in Aspen skiing and to draw attention to Mount Hayden. 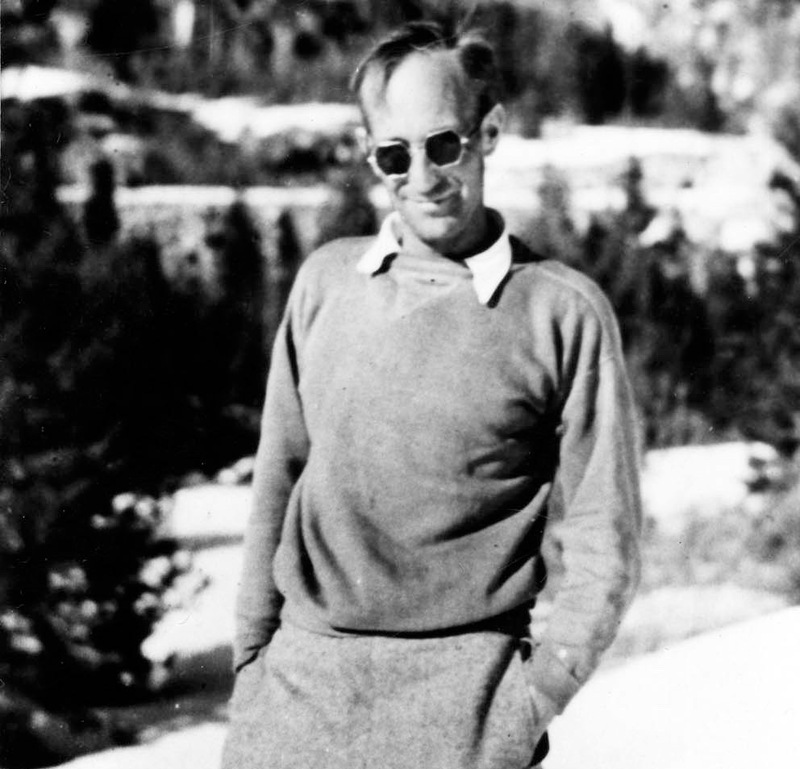 Unfortunately he was unable to assist Aspen volunteers cutting the run in summer 1937 because a U.S. judge deported him for collecting a monthly salary of $125 from HB while on a tourist visa, according to a 1976 letter Roch wrote to Ryan and a Times mention in the fall of 1937. 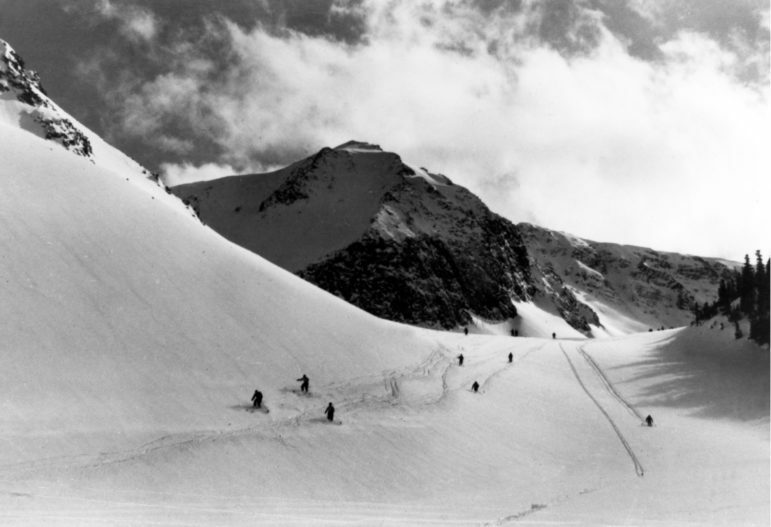 Roch preached an expanding ski complex with Hayden as the center, connecting to Cathedral basin, Montezuma, Taylor Pass, Richmond Ridge, and Aspen Mountain. He alternately conceptualized the midstation higher above American Lake, just below the ridge, where the alpine hotel would have a large terrace for sunbathing and service April-through-July bowl skiing. If the “teleferique business flourished,” he wrote, then a second tram to the actual top of Hayden Peak with a glass-enclosed house at 13,600 feet for summer viewing could be built. Highland Bavarian Corp. map of Ski-Hayden, drawn and signed by Andre Roch. A detail of a Highland Bavarian Corp. map of Ski-Hayden, drawn and signed by Andre Roch. What Roch labeled as ‘Ski Hayden’ was once called ‘Tom’s Peak’ and is not the open face, to the right on the map, known as ‘Ski Hayden’ today. He aggrandized that ski tourism would flock to the Euro model in the American West. The new area would accommodate beginner, downhill-only, and ski-touring skiers, in addition to providing competitive ski jumping, bob and skeleton sled runs, and skijoring. He suggested damming the “swamp land” north of Ashcroft to create a lake for skating, hockey and curling, topping it all off with a town focal point: a ski-jumping stadium. In a prescient vision one might wish existed today, he recommended luxury, medium-priced, and cheap lodge-like buildings that would welcome all income levels. 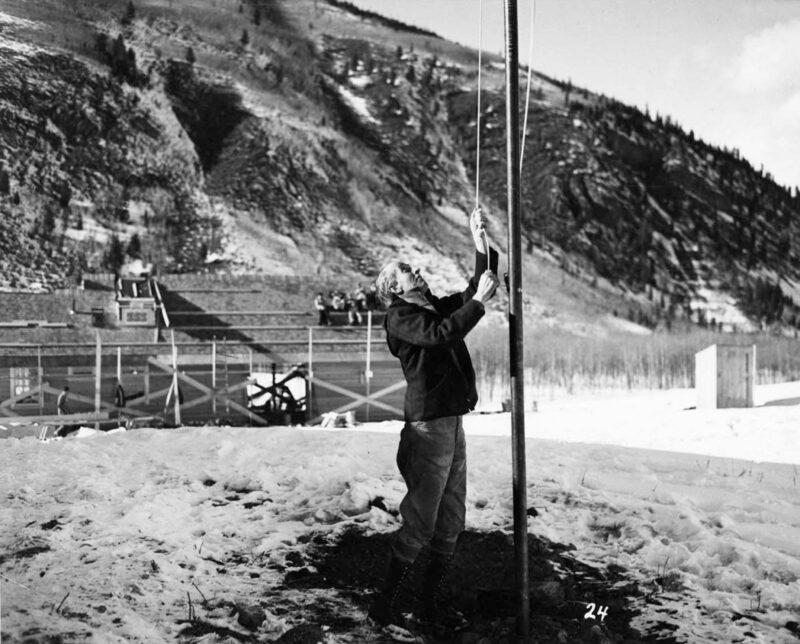 To keep Aspen marketing alive during a 1.5-year construction time without a dormancy, Langes wanted to build a 50- to 60-bed hotel in Ashcroft immediately for the 1937-1938 season, with a 4,000- to 6,000-bed capacity in the Swiss-style village as the final goal. His top station for the tram would sit near Electric Peak, though he did warn of lightning there. A full summer and fall use with a climbing school, hunting, and mountain-top views from the tram rounded out the grand plan. The logo of the Highland Bavarian Corporation. Some versions of the logo included a hyphen, others did not. With the focus shifted to Hayden rather than Richmond Ridge, the Highland Bavarian lodge fell on leaner times, opening haphazardly in 1938 and halting major business after that. Flynn, while traveling tirelessly to promote the project, complained to Tagert in letters footnoted in Ski Heil that the lodge needed repairs, unpaid bills were stacking up, and creditors were suing HB. Private funding for the enormous development did not match expectations, so the company issued more stock as a stop-gap measure. Meanwhile, Ryan resided in Connecticut, recovering from a serious collision with a tree in the Laurentians while skiing. Fiske, the embryonic enthusiast for the venture, was working for the family financial company in New York and London, where he married an English countess and famously drove a supercharged Bentley at breakneck speeds on country roads. Flynn, the unsung hero of the tram push, campaigned for public financing from 1939 to 1941 through the Colorado Legislature and the depression-era Reconstruction Finance Corporation of the U.S. government. He lobbied extensively in Washington, D.C., and Denver, while Ryan and Fiske behaved more like distracted absentee owners, the Ski Heil account inferred. In a Times letter of April 11, 1940, from Washington, D.C., Ryan praised a new technicolor film shot by Charles Grover of “Otto Schniebs and a party of five famous champions zooming down Mt. Hayden,” as “perhaps the most thrilling ski picture ever filmed.” The panoramic powder shots showing the bowls and peaks — including a white ptarmigan — trumped all other timber-bound ski films popular at the time. He rolled the film at the National Geographic headquarters in D.C., in Chicago, and all over Colorado. Tom Flynn hoists a flag in front of the Highland Bavarian Lodge in the fall of 1936. The lodge was still under construction. They opened on Dec. 26, 1936. The likelihood of war became a headwind for the project after Hitler invaded Poland in September 1939. Still, Flynn’s efforts paid off. The Times reported on March 27, 1941, that the Colorado Legislature passed “an emergency measure” authorizing $650,000 for the project ($10 million today), backed by an RFC government loan for American infrastructure. Flynn’s job devotion may have connected with the Yellow Boy Mine his father T.J. Flynn once owned in Ashcroft. Flynn had already negotiated with the Forest Service to finish the road up to Ashcroft in the summer of 1938. While Ryan and Fiske held majority stakes in the corporation, Flynn continued as COO, lodge manager, national booster, and bill-paying jury-rigger. The next shoe dropped after Germany steamrolled France and staged to invade Britain from Calais, beginning the 114-day bombing blitz called the Battle of Britain. In the face of that threat on his adopted country, Fiske joined the “Millionaire Squadron” of the Royal Air Force, comprised of the bluest of blood in England, plus one fearless American. Six days into the air defense of Britain, Fiske managed to land his riddled Hurricane fighter engulfed in flames on his home airfield of Tangmere on the English coast. He died 24 hours later of shock secondary to extreme burns, becoming an American and British hero. With Fiske’s death and the expectation that the U.S. would be entering the war, the question rose whether an international tourist project in the West was a wise use of American steel and manufacturing. Ryan, mourning the loss of his longtime friend and ski-dream partner, admittedly retreated. With tourist travel to Europe shut down, Flynn speculated that Hayden could provide an alternative. The Times reported on Sept. 4, 1941, that New York architect Ellery Husted had drafted a plan for Ashcroft. Forget the Swiss village, Husted said, and instead fashion a “Williamsburg of the west” faux frontier town, incorporating the ghost-town buildings to include the jail there that once, allegedly, incarcerated Jesse James. But on Dec. 7, 1941, the dream became moot when Japan attacked Pearl Harbor and the U.S. entered World War II. Ryan immediately went to Washington and offered all his Castle Creek property to the government for ski-troop training for $1 per year, before the 10th Mountain Division formed and chose Camp Hale in Leadville instead. 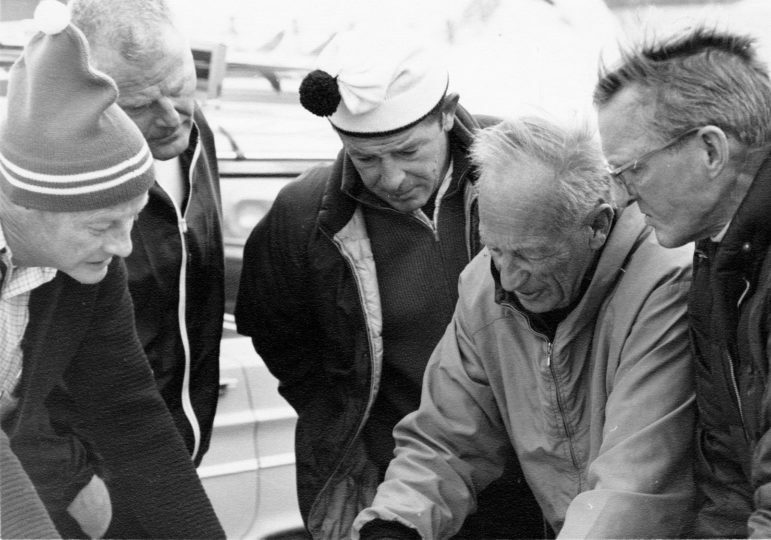 DRC Brown, unknown, Harvey T. Carter, Andre Roch, and Ted Ryan look at Roch’s Ski-Hayden map before a helicopter ski trip to Mt. Hayden for a last look-see at the possibility of a ski area there in 1967. To be feasible today Pitkin County and Forest Service approval would be hard to come by. With Ashcroft valley preserved by an Aspen Valley Land Trust and USFS deal, any resurgence of the Ski-Hayden plan would have to use an alternate access for lifts. The Times speculated when Ryan came back to town and stayed at the Jerome in September 1946, that “rumblings of the awakening of this valuable project [Ski-Hayden] seem to be vibrating in the air.” On June 3, 1948, the paper gushed further that “the Hayden idea still lives in the minds of Tom Flynn and Ted Ryan,” after Ryan leased his Ashcroft property to Stuart Mace for his husky kennels and Toklat lodge. Ryan apparently arranged an April 1967 helicopter ski trip to Mount Hayden along with Aspen Ski Corporation president D.R.C. Brown, Andre Roch, and legendary Aspen Mountain ski patrolman and mountaineer Harvey Carter. This look-see trip is documented in a series of color photos in the Aspen Historical Society photo gallery. Atop Mt. Hayden after a helicopter ride to check out Ski-Hayden ski-area possibilities in April 1967, are, from left, Paul Hauk, Ted Ryan, DRC Brown, Andre Roch, and ski patrolman Harvey T. Carter. In 1971, Sno-Engineering, then of Evergreen, Colo., completed a new Ski-Hayden design for Ryan. Their detailed blueprints at the Aspen Historical Society show four chairlifts, including a Cathedral Lake and Express Creek lift, a beginners lift just above Toklat, and two straight-shot tram routes to Hayden ridge. Eight more alternative lift alignments offered countless ski runs in what might have been the mega big-mountain ski area of the 20th century. But the success of nearby Snowmass had signaled a shift toward family-friendly ski development, making Hayden’s more extreme, Jackson-like terrain an investment anachronism—though today that big-ski daredevil market would be hot. At some point Ryan began to see things differently, because in 1971 he began giving his property to the Forest Service in exchange for a lease to the Mace family to open Ashcroft Ski Touring. Somehow a private parcel remained. In a complicated land swap between the Aspen Valley Land Trust and the Forest Service in 2011, the ghosts of Ashcroft, now managed by the Aspen Historical Society and Aspen Center for Environmental Studies, narrowly avoided a trophy-home site in their midst. Long after the death of a hero and a war, a dream that had been a slam-dunk development 80 years ago instead preserves Ashcroft and Hayden because of Ted Ryan’s change of heart. Editor’s note: Aspen Journalism is collaborating with the Aspen Daily News on in-depth stories about Aspen’s history. The Daily News published this story on Sunday, Dec. 17, 2017.